How can you balance the risk of deploying new technology with its many potential rewards? With the TCMS Software IP approach, you can take advantage of the openness and ubiquity of VoIP call and the maturity of Session Initiation Protocol (SIP) to provide the foundation for a new and better contact center. TCMS Software enables you to implement IP when, where and how it will benefit you. Whether you want to deploy a hybrid or an IP-only contact center, we have VoIP call solutions that offer the same sophisticated capabilities Our range of products offer you the choice between embracing IP to address increasingly dynamic processes and practices ,which provides the capabilities and reliability you need when looking to replace or incrementally add functionality to your contact center. 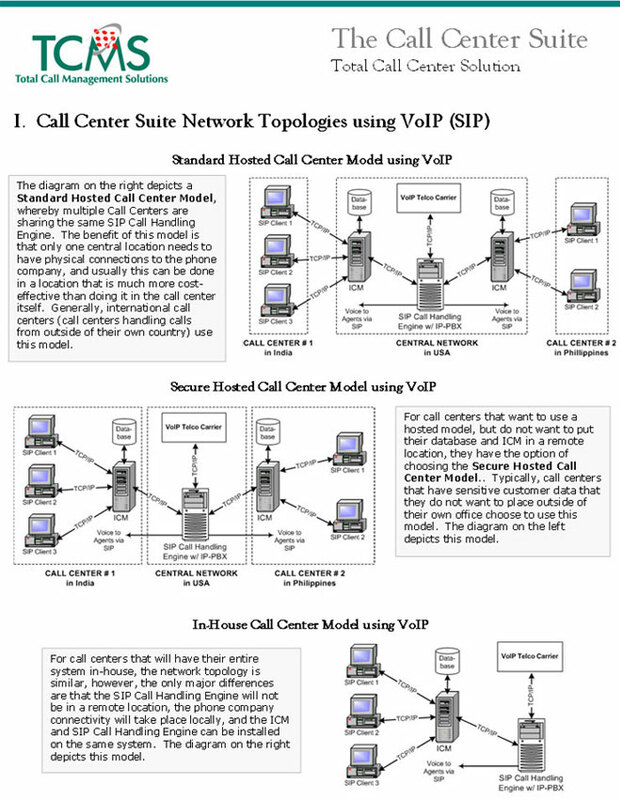 There are numerous ways to take advantage of VoIP call center software. Most notably Virtual Call Center solution is a classic example of taking advantage of IP call center technology to combine geographically dispersed call center locations into a centrally functioning unit. Many customers also choose to launch home based call center agents and/or small satellite remote call centers (2-24 agents) utilizing IP Dialers and home based call center agent solution. This is an extremely flexible allowing clients to implement the solution that suits their needs best. Web based home based agents is a Voice over Internet Protocol (VoIP)-enabled soft phone that uses the Session Initiation Protocol (SIP) for use on the call center software suite. it includes full support of remote call center agents for processing both inbound and outbound (blended) calls. Utilizing the latest advancements in VoIP and SIP, remote agents can be launched from anywhere in the world. These remote call center agents appear as seamless members of the entire call center agent pool and can be monitored, adjusted and activated exactly like agents working in the call center. Remote center or home agents can now be turned up without having to ship hardware devices for conversion from IP to analog. With Above mentioned approaches you can enhance productivity by providing greater choice, flexibility and control without compromising the contact center functionality you expect and require. Most importantly, Aspect Software protects your current technology investments and enables you to deploy customer-facing VoIP when you are ready. Whatever your approach to IP, we can help deliver a consistent customer experience across traditional voice and IP channels. Our IP-based solutions integrate business flows policies & Parameters with sophisticated customer contact strategies - removing barriers between the contact center and the business while delivering critical information to your agents. The bottom line. Improved customer service, higher customer retention, lower operating costs, improved ROI and best of all? the framework for an improved contact center including increased flexibility and functionality.